Originally from Deville, LA, Jamie Wallace has been practicing in the area for some time. During this time, she has provided quality care to the patients that she sees. She enjoys being able to meet with people and connect with them. She likes to listen to what they are going through and try to provide the best solution. She understands that surgery is scary, which is why she is there to provide assistance in any way possible. Jamie Wallace is married with three beautiful daughters. In her spare time, she enjoys spending time with family and traveling to new places. If she wasn't in the surgical field, she would pursue a career in baking. Her favorite place in all of Louisiana is New Orleans, where the excitement and energy can be felt. Jamie Wallace, P.A. has a specialty service currently in the surgical field. Helping out patients that not only are going in for procedures, but are recovering from them. 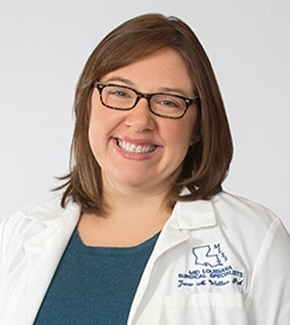 She provides quality, compassionate care and health information to these patients. Louisiana Academy of Physician Assistants. LAPA works to promote further learning opportunities and quality care for those working in the busy field. It works to help P.A.s provide the highest in quality pre-ventative and ongoing care. American Academy of Physicians Assistants. AAPA is the national professional society welcoming physicians’ assistants to come out and enjoy the information provided to not only further their understanding of their specialty, but also of their care. Jamie Wallace, P.A. is associated with Christus St. Frances Cabrini Hospital, Christus Cabrini Surgery Center and Christus Dubuis Hospital.